Bolt has made it onto the field in two previous pre-season matches. 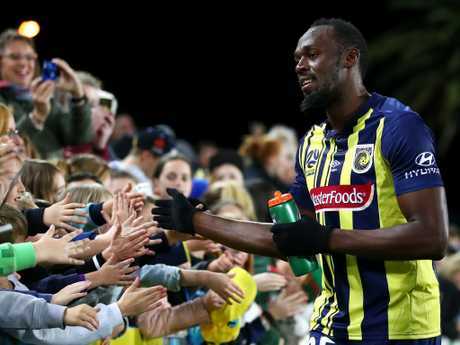 USAIN Bolt has scored his first - and second - goals for the Central Coast Mariners but fans are still not convinced. The world's fastest man was put into space and unleashed a low left footer into the back of the net. It was an impressive strike from the former sprinter as he aims to secure an A-League contract with the Mariners. Bolt gave his trademark celebration after scoring. 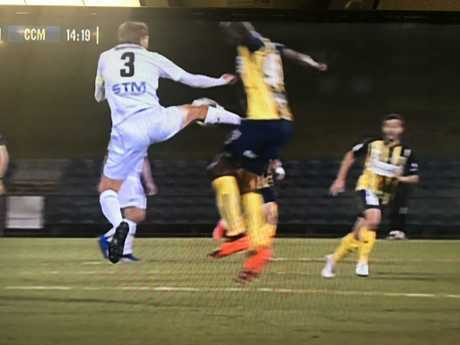 While Fox Sports were talking to coach Mike Mulvey, Bolt scored his second as the Macarthur goalkeeper and defender took each other out, meaning he was on a hat-trick. "You've got to be happy for him. It's one of those moments he'll treasure forever but it was just good football, he shielded the ball well and hit the target. He's had a couple of chances tonight." Mulvey then rushed back to the bench after saying Bolt was supposed to come off the field but Bolt signalled to the bench he wanted five more minutes. Speaking after he was substituted off the field, Bolt said he was happy with his performance. "I think I made some slight mistakes but it's my first real game with the first team. I'm just happy I got a chance and I'm proud of myself," Bolt said. While Bolt scored two, he also missed a couple with some nice headers and attempts. However, it was a moment in the first minute of the game which saw Bolt chased down which drew the commentators attention. Bolt found open space but was chased down by Macarthur defender Nathan Millgate, who will be able to tell his mates he chased down the world's fastest man. Usain Bolt celebrates with Jordan Murray after scoring his second goal. After having his shot spoiled by a defender, Bolt said moments like that weren't the end of the world. "The coach said to me, you'll get chances, you'll score some, you'll miss some, don't put your head down, keep your head up and try for the next one," he said. "It caught me surprised and I panicked a bit and over-kicked the ball. But the more you play, the more you learn and you get more accustomed to the game." When Bolt came from the field in the 75th minute, fans booed the decision. Bolt had a mixed first half with plenty of chances but also being floored in a nasty challenge. Mariners teammate Ross McCormack scored first to give the Mariners a 1-0 lead with the ball lobbing over Bolt with a strong header from the goalscorer. Bolt then found out what can happen in the heat of battle, rolling on the ground after a challenge caught him in a sensitive area. Welcome to Australian footbal Usain! After catching his breath, Bolt was back in the action, beating two players after a lucky bounce before his shot was dampened by strong defending by Macarthur. Bolt then had a golden opportunity after a cross to the box saw found the star with the header going just wide. The Mariners scored again before halftime to lead 2-0 but almost conceded one with the Macarthur attempt hitting the crossbar. Then Bolt got on the board, blowing the score out to 4-0, the final score in the match. Fox Sports commentator Mark Bosnich said although there were some slight improvements, Bolt still had a long way to go. "Slight improvement if you want to say that but his touch is still very poor," Bosnich said. "It's the most important thing for a footballer is his touch. We'll have to see how he goes for the rest of the time he's on the park but right here at the start where he seemed to be at his brightest, he did have a wonderful opportunity. "It's the most important thing for a footballer, his touch, was poor. "He's playing in a different position than he was in the first game. "His speed endurance is a little bit better but he still looked tired after 15-20 minutes. 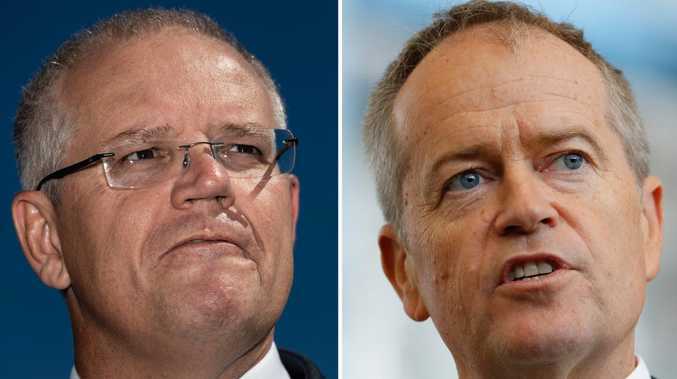 He just looks a little bit sharper, not a great deal to be honest. "There's a slight improvement but not very much." Usain Bolt had plenty of chances and finished with his first two goals. Mariners assistant coach Nick Montgomery said Bolt's first attempt at goal was "unfortunate". "I think his touches just took him to the wrong side and allowed the defence to get back but a good finished from Ross McCormack, so a good start, happy with the start," he said. "He (Bolt) has massive belief for a guy coming from a different sport to wanting to make it in football. Any kid could learn from his attitude and his belief." Social media lit up with news of Bolt's performance but many though he still had a long way to go. Usain Bolt scores, but the damage has been done. On the 54 minutes he has been on the park, it has been pretty dire tbh. 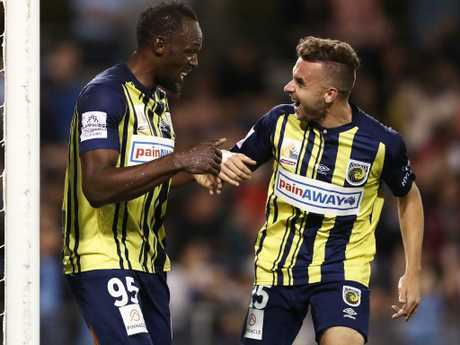 Usain Bolt heaped the pressure the start for the Central Coast Mariners, saying his performance in a trial game on Friday could determine his future with the A-League club. The eight-time Olympic sprinting champion is expected to start for the Mariners against a Macarthur South West United team in western Sydney. United plays in a second-tier competition. The 100m world record holder said he expected some nerves when out on the pitch, but was excited by the opportunity to prove his worth as a footballer. "This will be a big game. I think it will determine if the club makes up its mind on what to do with my career. So for me, it's a very important game," Bolt told Mariners' club media Wednesday. "I'm looking forward to prove myself. "For me, that's always a good step, when the coach is satisfied with your fitness to put you in the starting line up - that's always a big step. "I am just happy to get the chance and go out there and start, and do my best because that is the key thing." Usain Bolt has already been a huge hit with fans. The Mariners begin the A-League regular season on October 21 in Brisbane against the Roar. Bolt, who holds the 100m and 200m world records retired from competitive track and field but has focused on a professional football career. 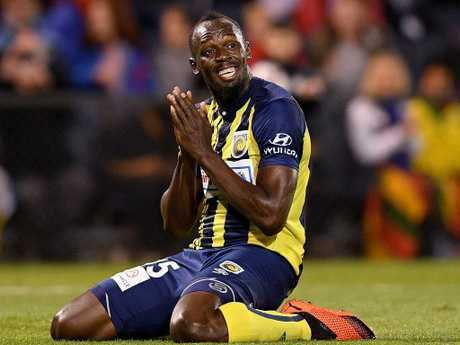 After being used as a winger in his first brief trial appearance in late August, Bolt hinted at a positional change for the match at Sydney's Campbelltown Stadium. Coach Mike Mulvey "said he wants to play me up top more," Bolt said. "The couple of games that I played, I didn't play with the first team. "There's a few first-team boys in the team for Friday. So I'll get different service, better service, because they're more seasoned and more mature. So he just told me to make sure I'm focused and push myself, and I'll just take the chances when I get them." The 32-year-old Jamaican track great said was pleased with his progress in football. "That's always a good step, when coaches are satisfied with the fitness to put me in the starting line-up. That's always a big step," Bolt said. "I can say I've been improving, (but) you won't know what level you're at until you actually play a competitive game." In late September, Mulvey said he could wait until January before making a final decision on Bolt's status with the team. 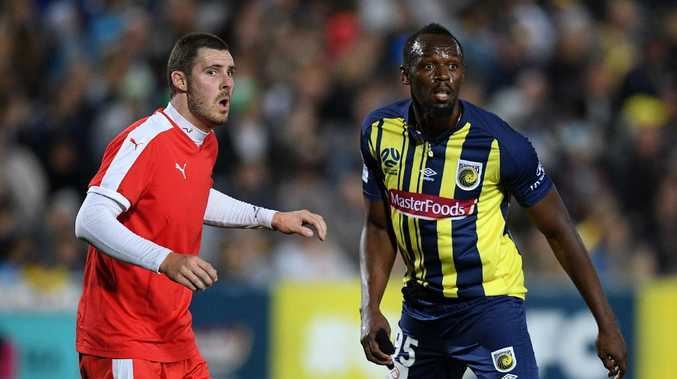 Usain Bolt is improving his skills and fitness as he fights for a Mariner contract. Bolt saw his first action for the Mariners on August 31, playing 20 minutes against a Central Coast invitational side. He played the entire second half against the North Shore Mariners on September 19, when he alternated between left wing and forward. Since then, Bolt said he has improved his fitness ready for the 90 minute game, rather than a sprint. "My movement and my touch is much better now," he said. "I've learnt how to set my body and where to place the ball." 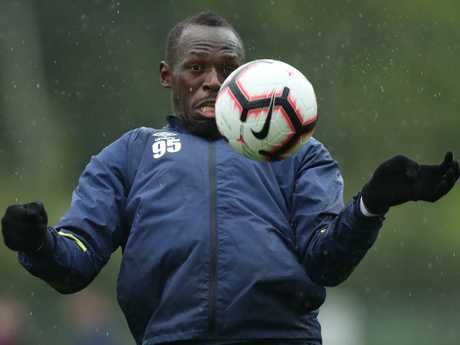 There was a big crowd on hand to see Bolt and the Mariners' last pre-season match before the start of the A-League season.